먼 북쪽에서 열심히 북극 지대를 탐험하고 있던 러시아 사람들도 남극탐험에 관심을 기울이기 시작하고 있었습니다. 1819년, 러시아 황제 알렉산드르 1세는, 항해가 파비안 고트리프 벨링스하우젠을 남쪽으로 보냈습니다. 벨링스하우젠은 캡틴 쿡보다 더 남쪽으로 가보라는 명령을 받고 있었습니다. 벨링스하우젠은 열심히 버티었지만, 캡틴 쿡이 도달한 지점을 눈앞에 두고 얼음에 막혀버리고 말았습니다. 그러나 그는 조그만 섬을 하나 발견 하여 러시아 황제 표트르 (피터) 대제의 이름을 따서 [피터 1세 섬]이라고 이름지었습니다. 피터 1세 섬은 남위 68.8도, 그러나까 남극권에서 240키로미터쯤 남쪽으로 들어가 있습니다. (Much of this information is drawn from, and used with the permission of, Robert W. Schmieder, KK6EK, and the volume: 3Y0PI: Peter Island Antartica, Cordell Expeditions Publishers, Walnut Creek California, 1994). Peter I Island was discovered by Von Bellingshausen in 1821 and the island was named after the Russian Czar, Peter the Great. The most prominent feature of the island is the mountain peak at the island's center which rises to approximately 5,000 feet elevation. Peter I was later claimed by Norway after Olstad and Larsen were successful at landing the first exploration-party on the island in 1929. 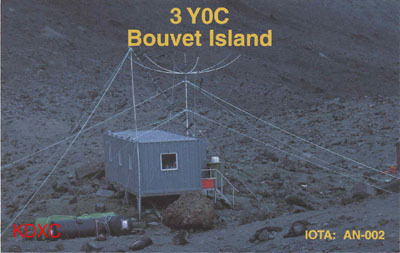 At the time of the 3Y0PI operation, Peter I Island was the most needed country on the ARRL DXCC "needs list", and had been visited fewer times than had the surface of the moon.. The island is located at 65 degrees, 50 minutes South and 90 degrees, 35 minutes west. It is an extinct volcanic island of about 230 square kilometers area. The island is typically surrounded by pack ice which prevents, or complicates any direct access to the island. 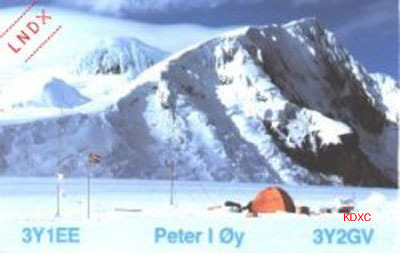 Peter I had been activated once prior to this expedition, that time by an expedition of two Norwegian amateur radio operators (3Y2GV (Kaare Pedersen), and 3Y1EE (Einar Enderud)). 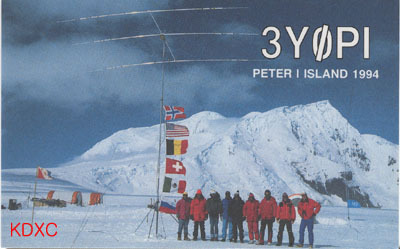 The 3Y0PI expedition was conducted from a glacier site. The SSIDXG and Ralph Fedor (team leader) received landing permission from the Norwegian Government in January of 1993, and made the planned operation public at Dayton in April, 1993. 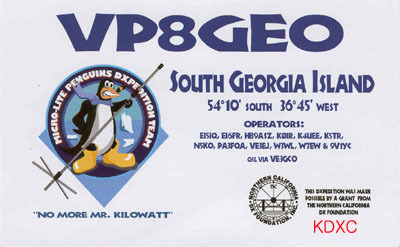 The core operators were the founding members of SSIDXG (from the South Sandwich Operation), plus several others. The team converged on Great Britain (Heathrow) to make the military/commercial flights to Ascension and the Falklands Islands, which was the jump-off point for the expedition. After some quality time in Port Stanley, the equipment was transferred to the Russian Ice-Breaker, research vessell Kapitain Khlebnikov. 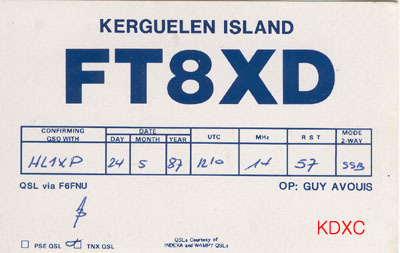 KK6EK and W6MKB were first on the island, delivered by Russian helicopter at around 1520 local time. The first Qso was made with IK4LAI on February 1, 1994. 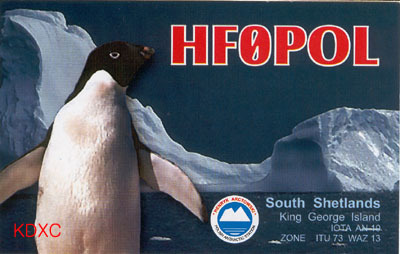 The SSIDXG expedition was on the island for a total of 22 days (January 29, 1994-February 20, 1994) and made over 60,000 contacts in 15 days between February 1 and February 16, 1994. The last station worked was K1TOZ at 2121Z. Landing was made via two helicopters which ferried operators and equipment from the Russian icebreaker Kapitain Khlebnikov to the island. Helicopter landing was essential as the island edges are actually mammoth glacier ice flows which break-off sharply and fall into the ocean. These ice walls are often sheer 100 foot ice walls, making harbors and anchorages logical impossibilities. Ambient temperatures during the Austral summer varied between a balmy +11 degrees Celsius (approximately 50 degrees Farenheit), to a more Antarctic -15 degrees Celcius (approximately 5 degrees Farenheit). Beyond the temperature extremes, gales were common with winds in excess of 70-75 miles per hour were common and made keeping antennas and equipment up and in operation a constant responsibility. 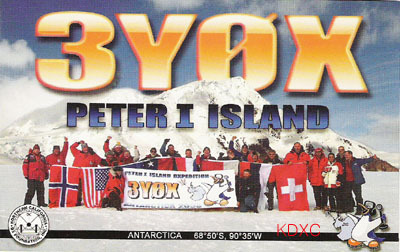 The dxpedition frequently had four stations on the bands simultaneously. The antennas were set up in roughly in a line from east to west so that the path to the earth's most populous areas was essentially perpendicular to the other antennas, and other yagis were typically located in the other antennas side null. 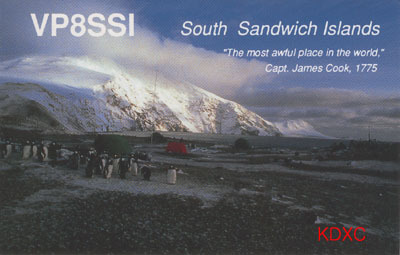 The expedition used four large tents, two for SSB and CW operations, and two for sleeping and as a cook tent. Antennas involved a Battle Creek special antenna for 160-80-40, two low band verticals (KA9Y vertical, GAP 160, 160 wire beam), 20 meter monobander (Cushcraft 20-3CD), 40 meter monobander (Cushcraft 40-2CD), 2 tribander yagis (Cushcraft A3S), a WARC tribander (Cushcraft A3WS), and 15 meter monobander (Cushcraft 15-3CD), and M2 satellite antennas. The expedition was totally self-contained as the landing vessel departed shortly after landing and would return 3 weeks hence to remove the expedition from the island. Power was supplied by Onan and Honda generators. Other equipment was supplied by Heil, I.C.E., Logikey, AEA, Bencher, Timewave, and Debco. The primary rigs were all supplied by Kenwood U.S.A., and amplifiers were provided by ETO/Alpha. The team was taken off the island by helicopters of a different Russian Research vessel, ice-breaker, the Akademik Fedorov, which first landed on February 17th, a Thursday. However, a pervasive and heavy fog descended on the island soon after, and further helicopter flights were impossible. There were no further helo flights Friday, and then began again on Saturday, the 19th. Because of the delay in getting materials off the island, the crew of the Akademic Federov may have made an attempt to force the dxpedition members to abandon much of their remaining gear (beyond personal gear) and climb aboard the helo. However, ON6TT, KK6Ek, WA4JQS, and N4GCK refused to climb aboard, thus guaranteeing that the helicopter would have to return on another day to complete the evacuation. All of the expedition's gear (all of it !!) were successfully removed from the island at 1622 local on February 20. 1738년, 프랑스의 항해가 피에르 부베 드로지에는 아프리카의 남쪽 끝에서 다시 남으로 항해 갔습니다. 수수께끼의 남쪽대륙을 찾는 항해로서는 처음 그리로 가 보는 탐험이었습니다. 그러나 그가 발견한 것은 그의 이름을 따서 [부베 섬] 이라 부르게 된 조그만 섬뿐이었습니다. 1771년에는 또 한 사람의 프랑스 항해가 이브 조제프 드 케르겔랑-트레마레크가 배를 몰고 나갔습니다. 그도 아프리카의 남쪽을 찾아서 돌아다녔지만, 다른 섬을 발견했을 뿐입니다. 이 섬은 지금 [케르겔렌] 섬이 되어 있지요. 부베 섬이나 케르겔렌 섬이나 그 때 알려져 있던 육지의 가장 남쪽에 자리를 잡은 케이프혼에서 남쪽으로 그리 떨어져 있지 않았습니다. 여기에서 캡틴 쿡(쿡선장) 이라는 이름으로 유명한 세계 제1의 항해가, 영국인 제임스 쿡이 등장하게 되지요. 쿡은 모두 세 번, 이름난 항해를 합니다. 1768년에서 1771년에 걸친 첫 항해 때, 그는 먼저 남태평양을 가로질러 뉴기니, 네덜란드, 뉴질랜드의 해안선을 따라 탐험했습니다. 그리하여 쿡은 타스만이 못 보고 만 그 육지를 똑똑히 본 것입니다. 정말로 너무나 커서 하나의 대륙으로 보았습니다. 캡틴 쿡은 라틴어의 [남쪽의 대륙]이라는 뜻을 이 섬을 [오스트레일리아]라고 불렀습니다. 이 섬에 참으로 걸맞는 이름이었습니다. 남아메리카와 아프리카는 오스트레일리아보다 훨씬 크지만, 두 대륙이 다 일부가 적도의 남쪽에 있을 뿐입니다. 오스트레일리아는 전부가 완전히 적도의 남쪽에 있었습니다. 오스트레일리아는 적도의 남쪽에서 발견된 것 가운데 가장 큰 섬이었습니다. 그럼, 그 너머에는 아무것도 없는 것일까요? 그 넓디 넓은 태평양에는 이제 더 큰 대륙은 없는 것일까요? 1772년, 켑틴 쿡은 태평양의 대부분이 펼쳐나가 있는 적도의 남쪽에는 이제 무었이 있는지 살펴보기 위해 두번째 향해를 떠났습니다. 그리고, 구석구석 살펴본 다음, 이제 남태평양에는 오스트레일리아 이외에 대륙이라고 부를 만한 큰 육지가 없다는 것을 밝혔습니다. 1773년 1월 17일 캡틴 쿡이 탄 배가 줄곧 남쪽으로 진로를 잡아 마침내 남극권으로 넘어 들어갔습니다. 쿡과 그의 선원들은 이 때 세계에서 처음으로 남극권을 넘어 남극대로 발을 들여놓은 것입니다. 하지만 남극권을 넘어도 쿡의 눈에는 육지의 모습이 보이지 않았습니다. 남쪽으로 갈수록 추위는 더 심해지고, 바다에 뜨는 얼음은 더 많아졌습니다. 캡틴 쿡이 남극권을 넘은 것은 이 먼 남쪽 끝에서도 여름철이었는데, 육지에 도달하기 전에 얼음이 그의 앞길을 막아버린 것입니다. 그는 남쪽으로 향하는 도중에서 조그만 섬을 발견했습니다. 그것은 푸에고 섬에서 동쪽으로 약 1천 8백 킬로미터 거리에 있었으며, 쿡은 그 때의 왕 조지 3세의 이름을 타서 [사우스 조지아 섬]이라고 이름지었습니다. [사우스 샌드위치 제도] 도 발견했습니다 ( 이 섬들은 그때의 영국 해군 총독 샌드위치 백작의 이름을 따서 이런 이름이 지어졌지요). 사우스 조지아 섬은 남위로 말하면 케이프 혼과 비슷하지만, 사우스 샌드위치 제도는 훨씬 남쪽에 자리잡고 있습니다. 이들 섬 가운데서 가장 남쪽에 있는 섬의 위치는 남위 59.4도이지만, 그래도 아직 남쪽 온대 안쪽이었습니다. 캡틴 쿡의 탐험 덕분에 먼 남쪽 바다에는 바다표범과 고래가 많이 있다는 것을 알았습니다. 바다표범의 털가죽은 아주 귀중한 것이고, 고래의 기름도 소중한 것이었습니다. 그래서 바다표범과 고래를 잡으려는 배들이 남쪽바다로 몰려들게 되었습니다. 탐험가들도 몰려왔습니다. 영국의 해군 사관이었던 윌리엄 스미스는 1819년 10월에 [사우스 셰틀랜드 제도]를 발견 했습니다 (이 이름은 스코틀랜드 북쪽에 있는 셰틀랜드 제도의 이름을 딴 것이지요). 이 섬들은 사우스 조지아 섬의 바로 남쪽에 있으며, 남쪽끝의 섬은 남위 63도에 있었습니다. 그때까지 발견된 것 가운데서 가장 남쪽에 있는 섬이지만, 그래도 아직 남쪽의 온대 속이었습니다. 이것이 남극권 안쪽에서 발견된 첫 육지였습니다. 그 후 벨링스하우젠은 남극 반도 서쪽에서 가장 큰 섬을 발견하여, 그에게 항해를 명령한 황제의 이름을 붙였습니다.